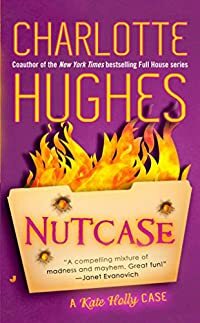 Nutcase by Charlotte Hughes, a Mysterious Review. Review: Everyone has days where it seems like everyone in their life is crazy. Unfortunately for Kate Holly, sometimes they actually are. It doesn't help that she's a therapist who can't seem to turn away patients, no matter how potentially dangerous, but Kate seems to attract crazy people. From the transgender ex-marine her mother has taken in, to the old woman who promises to cure her dog of depression, Kate's life is full of madness. And this doesn't even factor in her exploded office, lecherous ex, estranged firefighter husband, overwhelming family, and the spate of arsons that are the talk of the town! Charlotte Hughes has created a thoroughly engaging work of madcap fiction in Nutcase. It is fast paced, easy to read, written with a strong voice and a good sense of humor. The plotting is somewhat scattered, with characters and their conflicts moving in and out of the novel's focus. This creates a thoroughly lively and entertaining story that is almost impossible to put down. My only complaint is that the work seems to focus in on what seems to be the central mystery somewhat belatedly, making this less a classic detective-style work than a funny novel with elements of mystery worked in. Hughes' strength is clearly her characters, and their strong voices are convincing and extremely funny. The plot is likewise strongly character driven, focusing on the humorous and ever-changing relationships between the numerous characters. Sometimes, however, things can feel a little over the top. Dialogue occasionally reads like a sitcom rather than a novel, and realism is sometimes sacrificed for humor, making the characters less deep then they might be. However, most readers will find it easy to get into the light-hearted spirit of the work, and will enjoy it for the fun an intensely engaging novel that it is! Special thanks to Rebecca Henderson for contributing her review of Nutcase. Acknowledgment: Charlotte Hughes provided a copy of Nutcase for this review.